In this self-reflective moment, Ophelia is essentially standing in for this inaugural production of Dare Lab which re-writes Hamlet to give Ophelia’s voice greater central agency. James Parenti, who plays Hamlet (and who gave us a fantastic interview two weeks ago), adapted the canonical text, maintaining much of the original text but also writing some of his own where the women of Hamlet were otherwise silenced. The fact that Ophelia feels so comfortable rewriting “Gonzago” is only just a hint of the type of new power Ophelia (a riveting Gwenevere Sisco) takes on in May Violets Spring. Her motives and desires are given their due. Here, she, Horatio, and Hamlet make up a trio of friends, and within the friendship she is a key player. She and Hamlet have plans of leaving Denmark and making a new life together, and his scheme to play crazy throws their plans into limbo. Ophelia speaks some of the play’s most memorable lines, (“what a piece of work is man,” parts of “to be or not to be”) and dialogue that belonged to other characters (like Hamlet’s confrontation with Rosencrantz and Guildenstern) are placed in new context as part of her own plight. Within her family dynamic, she is a pawn in the political games of her father Polonius (Michael Griffin), who tries to stay on the new king’s good side. Soon enough, she becomes a victim to Hamlet’s games as well and is forced to hatch her own plans to ensure her survival. An economic hour and forty-five minutes gives the company enough time to cover the basic plot points and expand the world of the original play. Horatio (Monique St. Cyr) is given more significance (and a gender change) and Gertrude (Sarah Eismann) is allowed to meddle in her husband’s affairs with a heavy hand. But these changes are far more than just a behind-the-scenes expose at what really happened in Hamlet. In fact, Violets takes great liberty with the original, cutting and changing parts that do not serve the purpose of giving Ophelia new agency. In this new Ophelia, we find a fully-realized woman, an actor who takes her scripted fate into her own hands. What better way to celebrate Shakespeare’s birthday weekend (because I’m sure Billy Shakes would have partied all week long)! 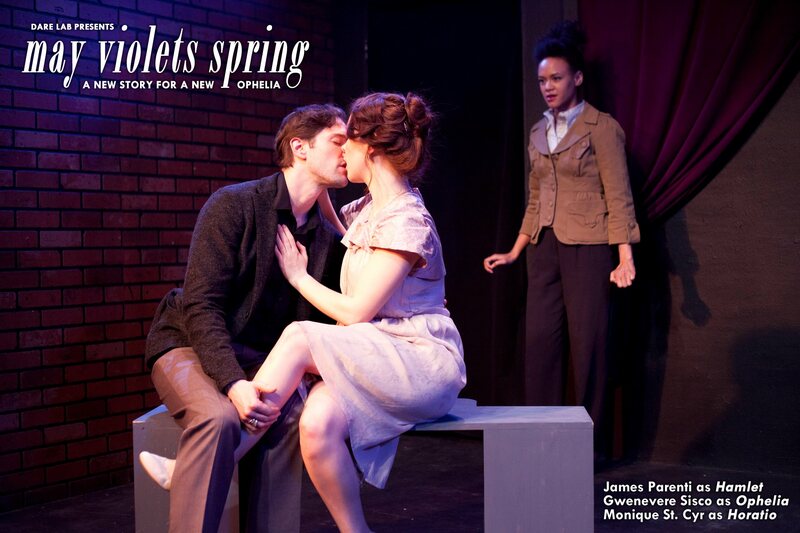 Catch May Violets Spring at Shetler Studios, playing through May 3rd. Tickets here!